Cards on the table: I have seen Avenue Q far too many times already. I will average a guess at eight visits both professional and amateur, but nothing was going to stop me going to see the current UK tour from Sell a Door Theatre Company. I don’t know what it is about those puppets but they always get me back for more, sometimes successfully and sometimes not so, however the performance I saw at G Live on Saturday proved a show like this can still pull some laughs from a seasoned fan who could easily mouth along with every joke and lyric. Robert Lopez and Jeff Marx’s comedy musical based on the oh so familiar life problems of the residents (both human and otherwise) of a cheap New York neighbourhood was a regular favourite for me in the West End several years ago. Having seen many different combinations of cast members over the years even I must admit that the musical can struggle with staying fresh. Many believe that once you’ve heard a joke it is less funny the next time and I somewhat agree. But then why go back time and time again to a musical that is 90% jokes? Well, the simple answer is to challenge the cast to bring some new ideas to their performance, which is what this lot did extremely well. The same punch lines I have heard a hundred times had a renewed sense of purpose thanks to real clever delivery, particularly from Stephen Arden who was hands down one of the best Trekkie Monsters I have seen. He took ‘pervert’ to a new level, and I say that in the nicest and most complimentary way possible. This trip down the Avenue did actually bring a first for me with Gary Coleman being portrayed (brilliantly) by a woman. The original Broadway production used female cast members in this role from the start but the West End transfer brought several scripting changes; I have only ever seen male Gary’s and thought it was a change for the better thanks to Delroy Atkinson in particular. Alas, I was proven wrong this time. Elena Vincent shone in the role in a way that I could never imagine a guy pulling off. I was impressed with the venue, G Live, too; modern, spacious, friendly staff and for once a ton of legroom! It was a shame that the auditorium was maybe a little too big and some of the sound was lost for me especially at the beginning, but I would definitely see a show here again. 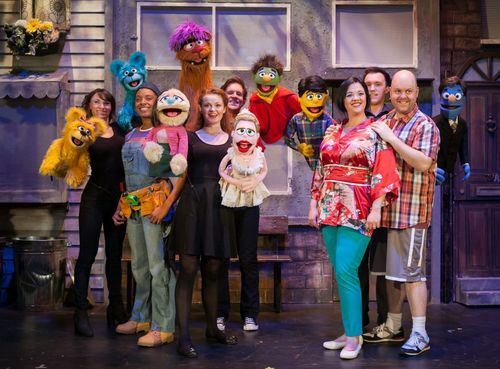 Tickets are still available for Avenue Q which continues touring the UK for several weeks ending at the New Alexandra Theatre in Birmingham on 20th September.